Kueh Bongkong is becoming quite an elusive kueh. Not many younger folks know of it, let alone to have tasted it before and as such, not many places sell it. It is essentially just a batter made with various starches and coconut milk, filled with a gula melaka filling that melts and oozes to flood the kueh as it steams. Some say a well made kueh bongkong should not reveal its filling after steaming but I choose to think otherwise, that if the kueh is not oozing or “banjir” with gula melaka, there is simply not enough of it in the kueh to begin with! The ingredients are incredibly simple. Just a mixture of rice flour and tapioca starch, the latter giving the kueh a nice soft and slightly bouncy texture. 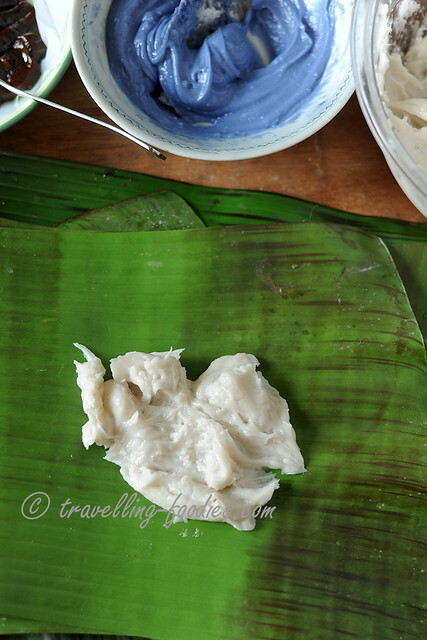 It is cooked twice in coconut milk, first to thicken the consistency in a pan over the stove, and then steamed to finish it off. 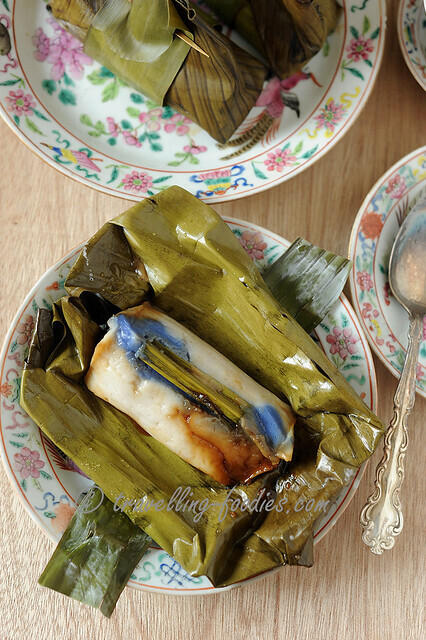 What makes it really “Peranakan” is the addition of bunga telang to colour part of the batter. 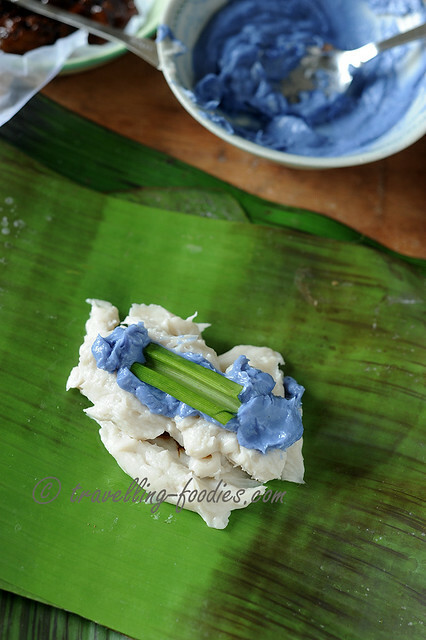 Banana leaves are used to wrap the batter and filling, in a fashion not unlike that of Penang Otak Otak. Gula melaka is the default sugar of choice though jaggery, gula nibong or even muscovado and Japanese kurozatou can also be used in the absence of gula melaka. A little sugar is used to tweak the sweetness while salt is used in any recipe that calls for coconut milk. Now comes challenge number 1, i.e. the cooking of the batter, which is for me the hardest to get right in making this kueh. Firstly, the flours have to be sufficient cooked so that the final product would not have the taste of raw flour, which is literally distasteful. Yet, it cannot be overcooked to the point of becoming too dry and tough after the kueh is being steamed. For me, a simple gauge is when the gooey mess JUST starts to turn viscous and JUST begin to stop sticking to the walls of the pan is a ‘telltale sign” that the batter is ready. It should not be watery, yet still retaining a good level of moisture. Ironic it sounds I know, but that is just how it is. And do sample the taste of the batter before wrapping. It should not taste of raw flour. That said, it is really a game of trial and error here. Make a few more times and one would soon know how to eyeball the batter to the right consistency during the cooking process. That is when the real learning begins. The bits of gula melaka is then covered with more batter. It is now that some of the batter that had been stained with the natural extract from bunga telang is added. 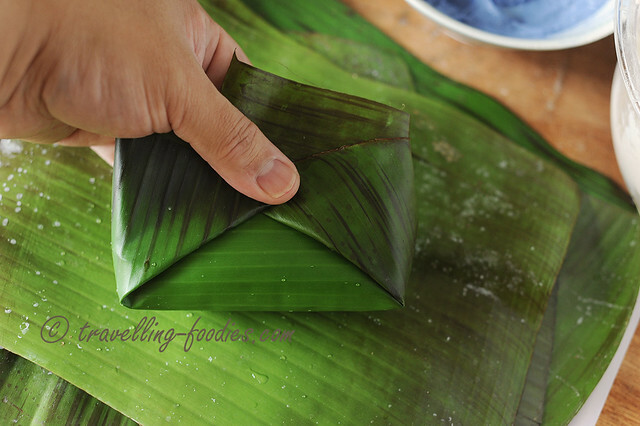 A piece of fresh pandan leaf is also added to accentuate the aroma during steaming. 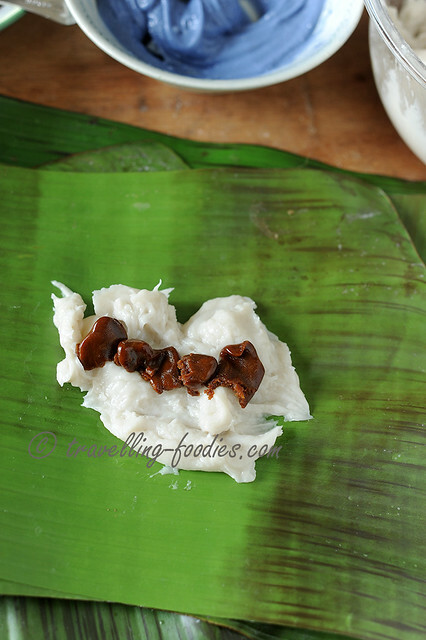 Another piece can be placed on the banana leaf to begin with but that is entirely optional. Then, repeat the same process for the other end and this is what a completed kueh bongkong should look like… well almost completed that is. 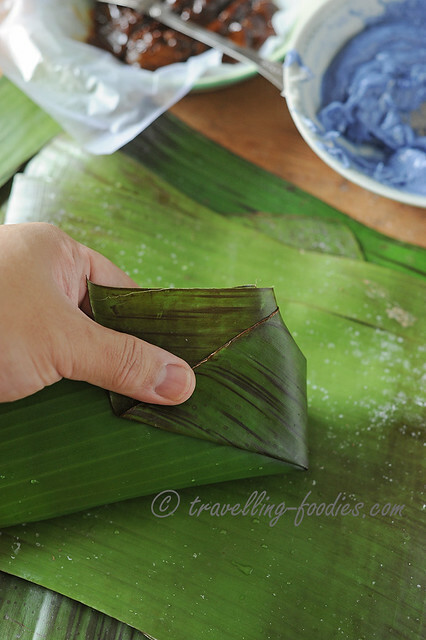 Another long strip of soften banana leaf, aptly called the “lidah“, aka tongue in “kueh making lexicography” is then wrapped over the base and aligned with the middle as seen in the photo above, The banana leaves are then secured with a “lidi” aka coconut skewer, upon which any excess banana leaf can be trimmed off. Otherwise bamboo toothpicks can also be used. The process is repeated until all the ingredients are used up. 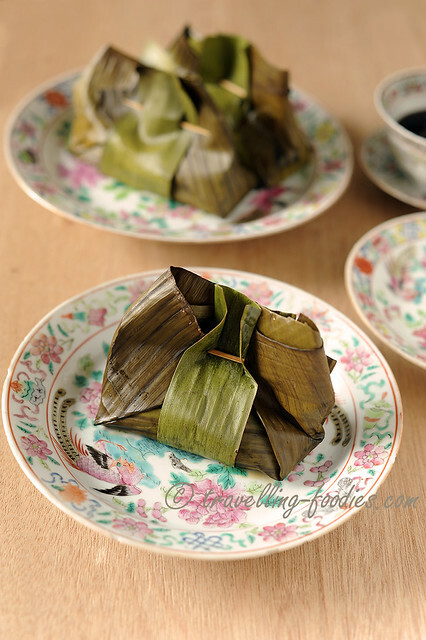 The wrapped kueh bongkong parcels are steamed over high heat for a good 20 minutes or so. 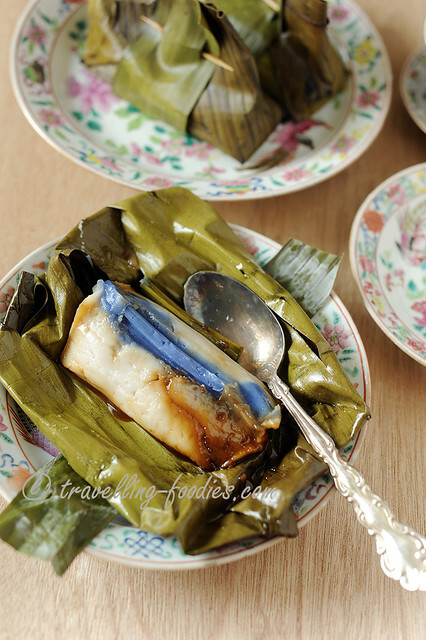 The kuehs can be eaten warm or at room temperature, though customarily, kueh bongkong is eaten chilled. So give the steamed kuehs a good couple of hours in the fridge after cooling down and you would be rewarded with a cool kueh that is chukop lemak, chukop manis with lots of sejok shiokness… instant gratification for the wretched weather we have been getting these days! In a mixing bowl, add the flours, sugar, salt and coconut milk. Give everything a good stir to homogenise. 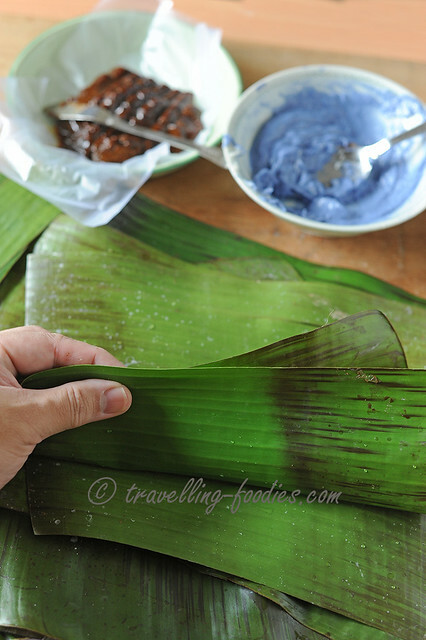 Pour the mixture and pandan leaves into a wok or deep saucepan. Stir over medium low heat until the mixture thickens considerably. Give the mixture a taste to make sure there is no “raw flour taste”. Turn off flame to let the batter cool down slightly. To a small bowl, add about 4 tbsp of batter and mix well with bunga telang extract. 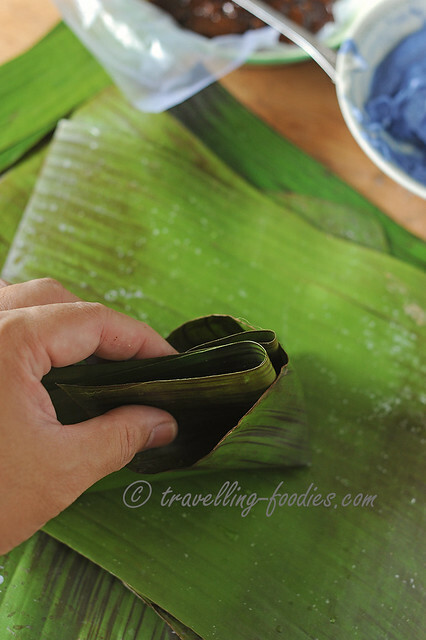 Place a piece of soften banana leaf over a working surface and clean the surface with a wet kitchen towel. Place a generous tbsp of white batter over the middle of the leaf and place a few nuggets of chopped gula melaka over the batter. 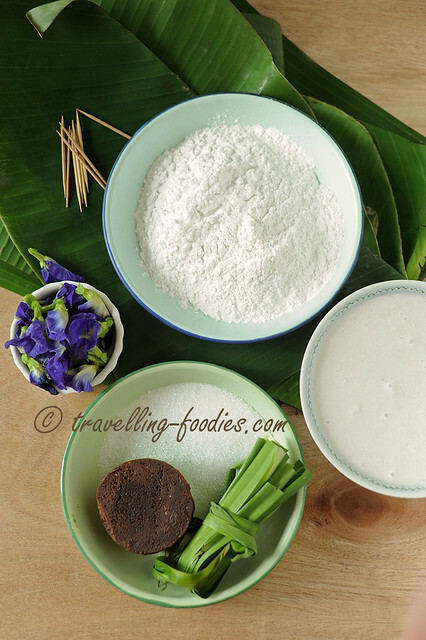 Cover the gula melaka with more batter, as well as some batter coloured blue with bunga telang extract. 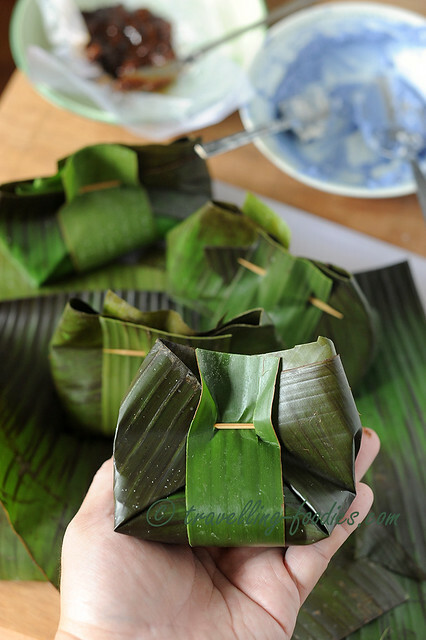 Place a small piece of pandan leaf over the top and wrap the kueh bongkong parcel as described in the photos above. Secure each parcel with a “lidah” and “lidi“. Repeat until all the ingredients are used up. Place the parcels in a steamer and steam at high heat for 20 min. Let the kueh bongkong cool down to room temperature before placing in the fridge for a couple of hours. Serve the kueh bongkong chilled. This entry was posted on October 4, 2016 by Alan (travellingfoodies). 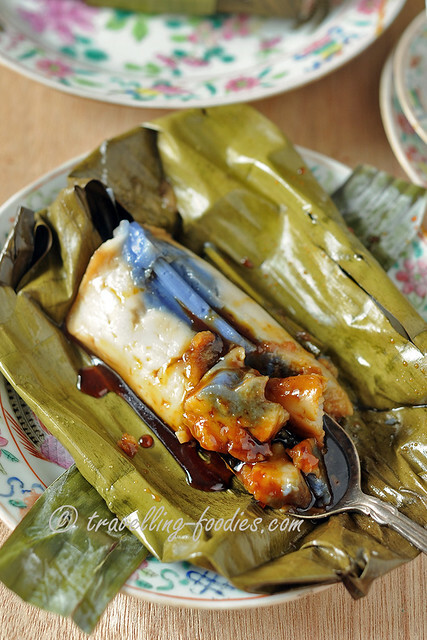 It was filed under Food, Simple Eats and was tagged with banana leaves, bunga telang, coconut milk, daon pisang, gula melaka, kueh, kueh bongkong, kuih, laok embok embok, nonya kueh, nyonya kuih, Peranakan, santan. Thanks for the wonderful pictures and sharing the recipe. What brand of gula melaka would you use ? The one I have at home does not melt at room temp. hmm… mine doesn’t have a brand. it is from melaka. given by a friend.